When you are the youngest of five kids you get a lot of hand-me-downs. That includes clothes, shoes, toys, and curriculum. Alaina doesn't mind using her siblings stuff, but she gets really excited when she gets something brand new in the mail. 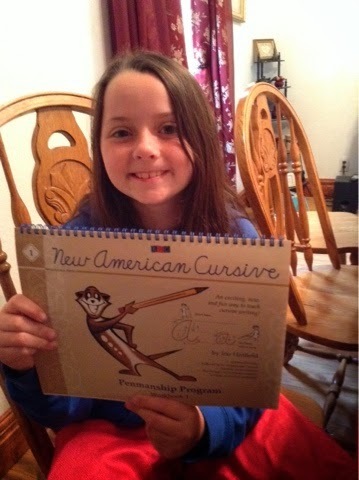 She was super excited when she received the New American Cursive: Penmanship Program Workbook 1 from Memoria Press. Workbook 1 of the New American Cursive is an 115 page softcover workbook. It is spiral bound at the top making it perfect for left or right handed children. There are pages for all 26 letters of the alphabet with review & practice sheets after every third letter taught. The beginning of the book teaches how to hold a pencil, proper paper placement, and three basic forms (the dot, straight line, and the curve line). There is a section of reproducible pages, and a sheet with all the letters & numbers with arrows to indicate how each should be made. Each worksheet uses three exercises. The student is taught how to make the letter correctly, they practice the letter by tracing it & then writing it, and lastly they play with the letter by writing words and drawing pictures. The review pages show the review letters with arrows to indicate the direction the letter should be made & there are samples and blank spaces to practice all three letters. A Handwriting Evaluation Checklist is included in the reproducible section. This sheet will help you evaluate the students handwriting in 11 areas. 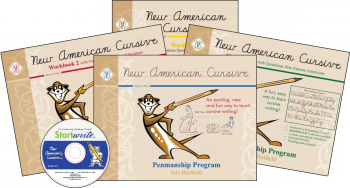 The New American Cursive Penmanship Program can be used by anyone learning cursive. They suggest learning cursive in the first grade before printing habits are ingrained, and learning new techniques confuses the child. Student sample writings are included to compare first and third grade students handwriting. A meerkat was chosen as a teaching guide because meerkats work as a team, they each have a task in their social network. Cute little meerkats are everywhere in this book & Alaina loved coloring them every day. There are two more workbooks in the Memoria Press Penmanship Program that help the student focus on accuracy & legibility. They also help the student connect letters fluidly. A StartWrite/NAC software is also available to create customized worksheets. Alaina already knew how to write in cursive, but her penmanship was a little sloppy. I chose to use this with her to help her become neater in her writing. She did one worksheet every day & practiced in her other school work by answering all her questions in cursive. It has really helped her with the legibility of her letters and her penmanship. I agree with Memoria Press on starting cursive with children in first grade & I wish I would have known that when my oldest daughter was learning to write. She is left handed & no matter how many times I would show her the proper way to print letters she always started at the end of the letter and wrote toward her left hand. Her print letters looked correct but drew them from end to start. 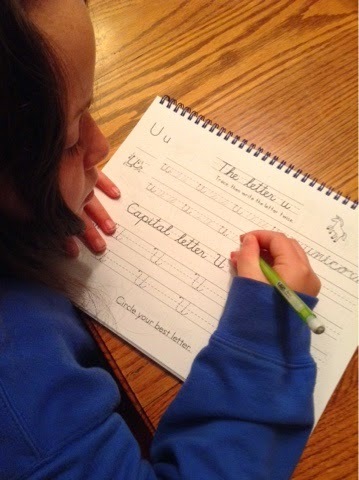 Once she started learning cursive and connecting her letters together she made them correctly. Even now as an adult if she is printing she will print most of her letters starting at the end and moving to the start of the letter.